The 2012 United States presidential election in Texas took place on November 6, 2012, as part of the 2012 General Election in which all 50 states plus The District of Columbia participated. Texas voters chose 38 electors to represent them in the Electoral College via a popular vote pitting incumbent Democratic President Barack Obama and his running mate, Vice President Joe Biden, against Republican challenger and former Massachusetts Governor Mitt Romney and his running mate, Congressman Paul Ryan. Mitt Romney won the state of Texas with 57.17%, over Barack Obama's 41.38%, a margin of 15.78%. 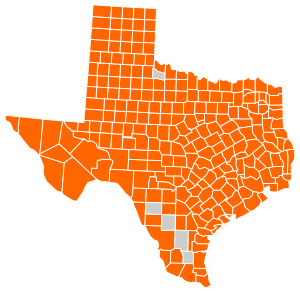 As in past elections, President Obama and the Democrats dominated the Rio Grande Valley and won the major urban centers of Austin, El Paso, Dallas, San Antonio, and Houston, but Republicans were able to overwhelm the urban vote by sweeping the vast rural areas and suburbs of Texas by large margins. In the process Mitt Romney beat George W. Bush's 2004 record of the most votes for a presidential candidate in Texas, a record later surpassed in 2016 by Donald Trump. By receiving 95.86 percent of the vote in King County, Romney also recorded the highest proportion of any county's vote cast for one candidate since Barry Goldwater received between 95.92 and 96.59 percent of the vote in seven Mississippi counties[a] during the 1964 election – although this occurred when African-American majorities in these counties had been almost totally disenfranchised for seven-and-a-half decades. Barack Obama John Wolfe Jr. The 2012 Texas Democratic Primary was held on May 29, 2012. 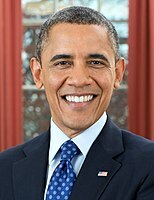 Incumbent Barack Obama, who was running for the nomination without any major opposition, won the primary with 88.18% of the vote, and was awarded all of Texas' 287 delegates to the 2012 Democratic National Convention. The Republican primary was held May 29, 2012. 152 delegates were chosen, for a total of 155 delegates to go to the national convention. The election was originally scheduled to take place on Super Tuesday, March 6. Due to litigation over the state's redistricting following the 2010 United States Census, it was rescheduled for April 3. That date also became uncertain and the primary was expected to be held, at the earliest, in late May 2012, with both May 22 and May 29 being proposed. U.S. District Court judge Xavier Rodriguez, one of the three judges overseeing the litigation, had suggested a June 26 date for the election. Finally, on March 1, 2012, the court issued an order setting the date of the primary to May 29, 2012. ^ "2012 General Election, Texas Secretary of State". Retrieved November 17, 2016. ^ "2012 Democratic Party Primary Election, Texas Secretary of State". Retrieved November 17, 2016. ^ a b Fernandez, Manny (March 2, 2012). "Texas: Primary Election Set for May 29". New York Times. Retrieved March 12, 2012. ^ "Judge in Texas redistricting case tells Republican state officials to plan for May 29 primary". Washington Post. Associated Press. February 15, 2012. Retrieved February 22, 2012. ^ "2012 Republican Party Primary Election, Texas Secretary of State". Retrieved November 17, 2016. ^ Counties where Goldwater exceeded Romney's King County proportion were Amite, Franklin, Grenada, Holmes, Leake, Noxubee and Yazoo. This page was last edited on 21 April 2019, at 07:41 (UTC).